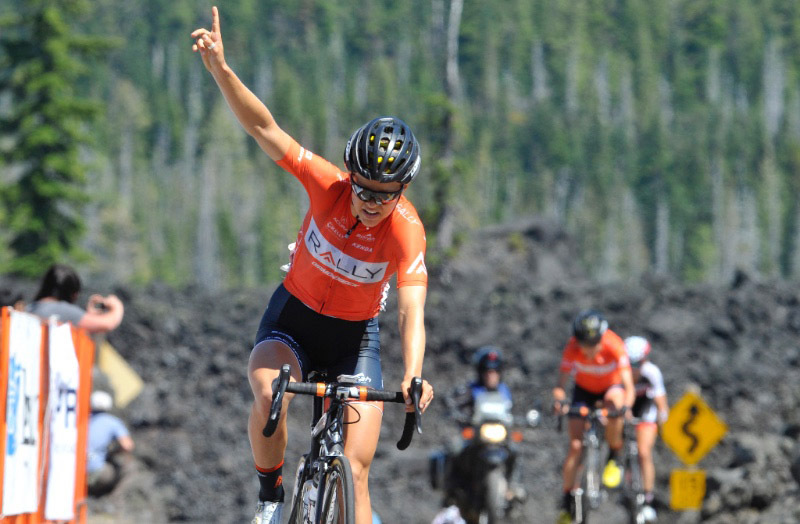 Kristi Lay and Sara Poidevin laid a one-two punch on the Cascade Classic today for Rally Cycling, finishing first and second place at the McKenzie Road Race. Allie Dragoo (ShoAir-Twenty20) took third after 88 miles (144km) of racing. "We wanted to control the pace and put pressure on some of the other teams to draw out some of their bigger riders," Lay said. "With 200 metres to go I jumped off Twenty20's wheel and got to win. My teammates made it work for me." It was a quiet start to the opening stage of the 38th edition of Cascade Classic, with many riders opting to save their legs for the final climb up to Dee Wright Observatory. When the climb hit, Rally Cycling, Colavita-Bianchi and DNA Racing swapped punches that popped more than half the field off the back. Less than 20 riders remained with 10 km to go. 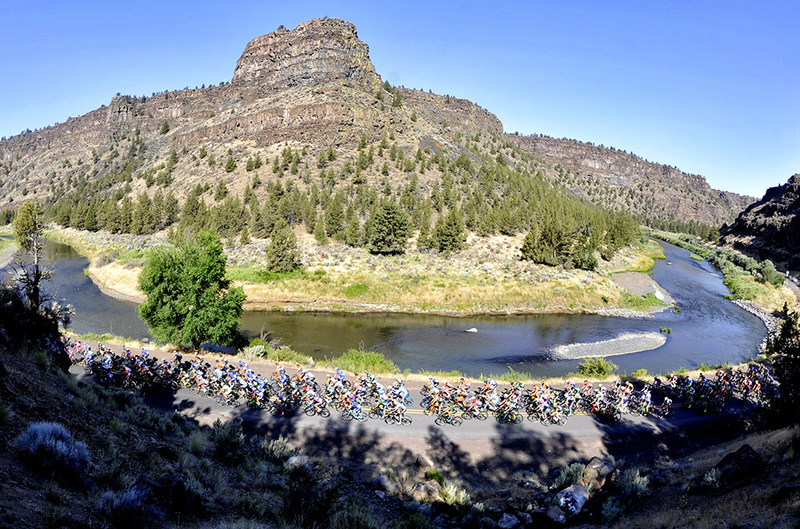 As the road rose up to meet the lava fields at the top of the mountain, so did the top talent in the 76-rider field. Lay will start stage 2 in the yellow jersey. The Rally rider also leads the QOM classification, so Dragoo will wear the polka dot jersey. Sara Bergen (Rally) is in the green jersey and Poidevin will wear white as the best young rider. "It's a big week of racing coming up," Lay said. "We have a team where a few riders could wear yellow so we have a lot of cards to play, it's not necessarily just me, so we'll definitely try and put in a strong performance." 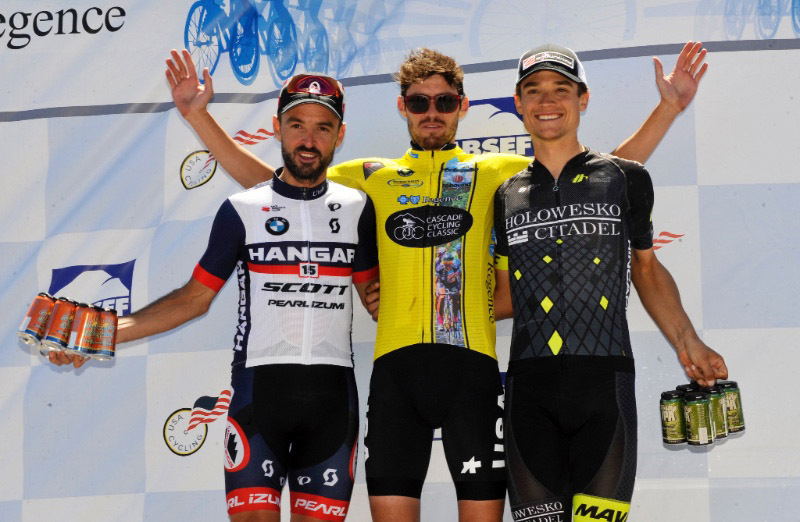 In the men's race, Alex Howes, racing this week with the USA National Team, took the win in the final 100m ahead of Paco Mancebo (Hanger 15 Bicycles). Last year's winner, Robin Carpenter (Holowesko) came in third. Howes also picked up the KOM jersey, winning on the cat 2 climb for the finish at McKenzie Pass. "It was just one pedal after another for that final climb," Howes said. "It's a tricky finish, even though it's uphill, it's pretty fast, and a little sandy. The team did a great job to get me and Kiel Reijnen in position. Kiel just said go at 100m and that's what I did." The men raced for 107.8 miles, with a cat 4 KOM climb 20 miles into the race. The field was very active as attack after attack came in order to establish a break. It took nearly half the stage before a 14-rider break was finally allowed to escape. Shortly before the only sprint points of the day and the final climb, 5-rider attacked the break and established a new lead group. "We chased, we didn't get too many time splits honestly, so we were going off feel, trying to figure it out." Carpenter said. Holowesko|Citadel has won the general classification for the past 2 years. "Fortunately, there's always a massive headwind on McKenzie Pass. I knew it would be tough for the break, and I knew that if we got to the bottom of the climb and we had 2 minutes or less, we would probably catch them…we had zero help, none at all (for the chase), so that was especially impressive. I was happy about how I did, even if I didn't win." Back in the field, race radio communication was breaking up, not able to give out time gaps for some time. Thus, the break enjoyed up to a seven-minute lead. "Day was a little stressful," Carpenter added. "We let the gap go out a little too much, everybody had a guy up there. It could have been a repeat of what happened a couple of weeks ago at Tour de Beauce where the break gets 20 minutes. It was too bad I couldn't win again but I'm pretty happy to be on the podium." Howes does not expect to keep the yellow jersey following tomorrow's Skyliners Time Trial. "Both of these guys are going to take quite a bit of time out of me in the TT tomorrow, realistically," Howes added. "I didn't bring a TT bike up, it didn't fit in my car. Hopefully, that will make this more of an interesting race. We're going to have to be aggressive later on this week." Howes leads both the GC and the KOM competition, with Greg Henderson (UHC Pro Cycling) leading the sprint points classification, and Santiago Montenegro (Movistar Team Ecuador) leading the Best Young Rider's general classification. Mancebo will wear the KOM jersey for the TT. Thursday's stage is a 14.3-mile (23 km) out and back individual time trial. 5 Jasmin Duehring (MXT Sho-Air TWENTY20) s.t. 16 Jessica Cerra (Hagens Berman Supermint) all s.t. 25 Carrie Cartmill (JVelo Cycling p/b The Freewheel) both s.t. 28 Starla Teddergreen (Hagens Berman Supermint) s.t. 29 Elyse Fraser (New Zealand Cycling Team) both s.t. 32 Alison Tetrick (Cylance Pro Cycling) s.t. 34 Katherine Salthouse (Landis/Trek) s.t. 41 Liza Rachetto (Hagens Berman Supermint) both s.t. 43 Calle Swan (Trek Red Truck Racing) s.t. 45 Grace Anderson (Team Illuminate) s.t. 54 Jessica Mundy (Colavita |Bianchi) all s.t. 68 Astrid Gassner (Colavita |Bianchi) s.t. 4 Gavin Mannion (United HealthCare Professional ) all s.t. 29 Chad Beyer (Hangar 15 Bicycles) all s.t. 43 Logan Owen (USA National Team) all s.t. 45 Ulises Alfredo Castillo Soto (Jelly Belly p/b Maxxis) s.t. 50 Joseph Lewis (Holowesko / Citadel Racing p/b ) s.t. 53 Steve Fisher (Hangar 15 Bicycles) both s.t. 55 Zachary Nehr (Storck-CCN) s.t. 75 Johnathan Crandall (Team Oregon p/b Laurelwood Brew) all s.t. 77 Sean Gardner (Gateway Harley Davidson/Trek U2) s.t. 80 Greg Henderson (United HealthCare Professional ) s.t. 86 Emile Jean (Silber Pro Cycling) all s.t. 92 Bonaventure Uwizeyimana (Team Rwanda) all s.t. 100 Sam Andersonmoxley (Team Mikes Bikes) all s.t. 108 Christopher Harlanddunaway (Herbalife p/b Natures Bakery -) all s.t. 128 Tanner Putt (United HealthCare Professional ) all s.t. 140 Jose Alfredo Aguirre Infante (Canels - Specialized) all s.t. 152 Taylor Shelden (Jelly Belly p/b Maxxis) all s.t. 156 Rex Roberts (Pacific Premier Bank Cycling Te) s.t. 157 Owen Gillet (Storck-CCN) s.t. 164 Quinten Kirby (Support Clean Sport/SeaSucker/G) s.t. 179 Paul Thomas (Team Mikes Bikes) s.t. 183 Maxwell Anderson (Project Echelon Racing) s.t.